Appearance Free flowing, homogeneous & uniform paste. Coverage 3 m2 per ltr per coat. Shelf Life 24 months from the date of manufacturing. Store in a cool & dry place. Wind Driven Rain Resistance No moisture penetration after 24 hours. 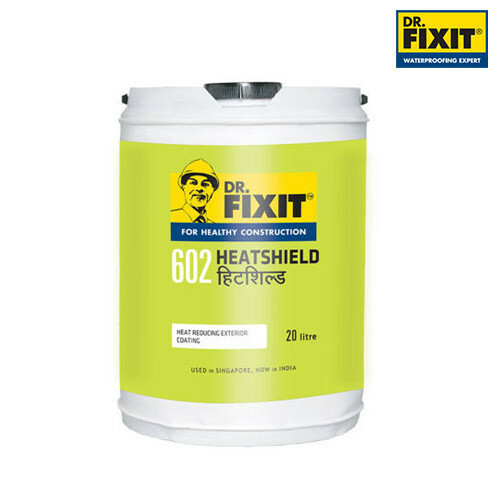 Dr. Fixit Heatshield contains advanced material of ‘Hollow Microspheres based on Borosilicate Glass as microbubbles’ having remarkable ‘Heat Insulation’ property. The unique spherical shape of the glass bubble produces stable voids which result in low thermal conductivity and a low dielectric constant. When applied on a substrate, the hollow microspheres form a closely packed structure like ‘AirSpace’ within the dry film layer that serves as insulation medium to resist heat transfer. Dr. Fixit Heatshield has thus the ability to slow down heat transfer remarkably and keep interiors of an externally coated surface of a building cooler by re-radiating most of the solar heat back into the atmosphere. Heat Insulation - Reduces the conductivity of heat from exterior to interior, thus lowers the temperature. UV and IR resistant - Resistance to UV & IR emission, protects the coating from damage and reduces heat conductivity. Microbial resistant – Resistance to algae and fungus growth results into lesser maintenance. Energy Saving - Reduction in electrical consumption for air-conditioners, saves energy cost. All surface cracks up to 5 mm width should be filled up with Dr. Fixit Crack X or Dr. Fixit Unifiller. Cracks more than 5 mm and all separation gaps should be filled up with Dr. Fixit Pidicrete URP or Dr. Fixit Unibond SBR modified mortar or as specified. Prime the metal surface with suitable anti-corrosive primer. Priming is not required for new GI sheets. Apply 3 coats of Dr. Fixit Heatshield without any dilution by brush or roller at an interval of 2-3 hours. Allow the coated surface to air cure fully for 7 days. Metal surface should be cleaned to remove existing paint, rust by appropriate mechanical or chemical means. Always to be kept as the final coat. i.e. No overcoating on Dr. Fixit Heatshield. Skin Contact: Wash skin with soap & water. Remove contaminated clothes. On eye contact: Immediately splash eyes with plenty of water. Consult Physician if irritation persists. Ingestion: Do not induce vomiting. Never give anything by mouth to an unconscious person. Call a Physician.